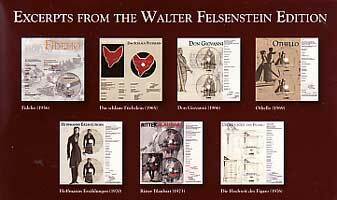 Walter Felsenstein (1901-1975) was a critical figure in the development of opera, responsible for some 190 productions at the Komische Opera in Berlin. Seven of these have been preserved on films originally shown on television, upgraded with digital restoration and re-packaged for recent release in a flat box format. Musical Pointers has received only a sampler, which whetted our interest, but which we would not normally be expected to review (it does not offer subtitles). We have since been able to see several of the later DVD productions. We cannot let pass the opportunity to recommend to our readers especially a studio film of Offenbach's operetta Bluebeard *. Felsenstein's take on the Bluebeard story [pictured directing Hanns Knocker as Bluebeard] is a subversive depiction of totalitarian excess and abuse of power, no less frightening for being set to light music and with a happy ending. The diminutive King is a grotesque figure, his rantings sure to bring to mind Hitler, with the courtiers bowing ever lower and grovelling with agreement to preserve their chance of survival and possible promotion... Did this production influence the controversial politicization of Neufels' Fledermaus at Salzburg? The Fidelio is also of interest, although even after restoration it shows its age in picture quality and sound. But it appears to be one of the first attempts to make a film of an opera which is not an adaptation of an opera house production, and it has emotional intensity which survives the passage of time since the mid-'50s. There are some snags in handling the new package. Firstly, it is inordinately heavy! Each opera is mounted separately on a thick board, 30 cm square. There is a richly bound bilingual book, generously illustrated and with extensive background for each of the productions. But the essays seem not to have been proof-read by a native Briton; e.g. 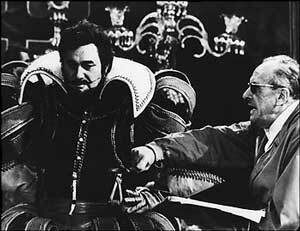 "Don Giovannis Flucht vor sich selbst" is translated "Don Giovanni's hight from himself"!! A not uncommon shortcoming with multi-lingual productions. The contents are so tightly packed that the only way to get the separate operas out of the box is to turn the whole thing upside down into the lid, which allows just enough room to get your fingers in at the edge; perhaps it is more manageable in the thick box form (R), which we have not seen. 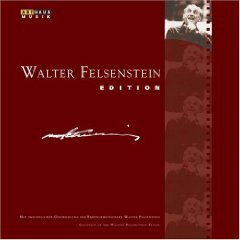 Of particular importance is the Cunning Little Vixen which Feldenstein introduced to Berlin audiences in 1956; a historic film from a time when Janacek was still a largely unknown composer. And that had, sensibly, been released separately and reviewed by Musical Pointers alongside two other versions of this delectable work [Immortal 960001]. 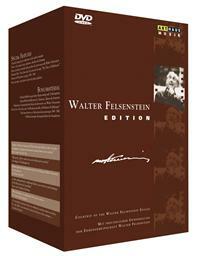 However, the whole collection is something exceptional, of unsurpassable importance for opera collectors, and if the price (in these hard times) proves a disincentive for purchasers, it might be prudentl for Arthaus to consider releasing the others of these important historical films separately and in a more convenient form? Pending that, readers might be able to persuade their local libraries to stock the lavishly produced, though flawed, box.